Back to work after a short retirement, Ms. Chalmers has a combined 19 years of experience in the massage therapy field, many of which were with our clinic. Both our patients and the entire staff of this clinic are ecstatic to have her back to doing the massage therapy work for which she is so well-known. Her many years as the resident massage therapist at our clinic, as well as with a rehabilitative physical therapy clinic, in addition to her many years of knowledge within the chiropractic field, make her specialized massage therapy sessions an excellent choice to compliment your chiropractic treatment. She has advanced knowledge in physiology and is able to work with the doctors of this clinic to use the best of both practices to optimize your health goals. She specializes in a deep-tissue massage that, whether you combine with chiropractic treatment or not, will absolutely be one of the best massages of your life! 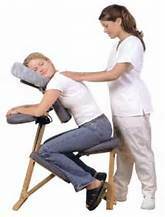 In addition to the traditional table massage sessions of 30 or 60 minutes, Ms. Chalmers also offers a 15 minute chair massage. These 'mini-massages' do not require an appointment, but are subject to availability. Please call our office at (586) 477-1800 for more information or to schedule your appointment. Ms. Chalmers is a life-long resident of Macomb County, and was traditionally trained in Swedish massage from Irene's Myomassology Institute. She graduated in October of 2000, and since that time, has also received an Associate's degree in Applied Science; Chiropractic Assistant.